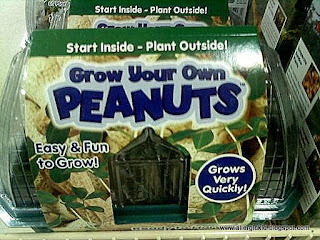 Another lousy camera phone pic, this time of one of the worst presents ever: Grow Your Own Peanuts! You can find it at your local retailer on the shelf between the Mix Your Own Rat Poison Chemistry Set and My First Matches. Hah! You should see me twitch around bulk bins of peanuts.